Anytime we are learning a new skill we are likely to make mistakes. Making a mistake is a very valuable part of the learning process. Unfortunately, society has taught us that making mistakes is a bad thing. It is not uncommon for a person to feel embarrassed, ashamed or stupid because they made a mistake. The idea that we will be perfect and never make a mistake is absurd. Often the fear of making a mistake will deter a person from trying new things. Now consider how we treat dogs when they make a mistake when they are learning? Dogs are commonly labeled as stubborn, stupid or sometimes dominate when they make a mistake. 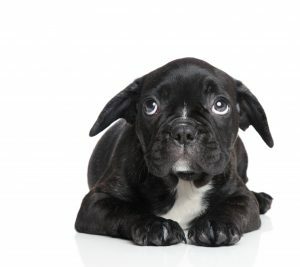 This often happens when a person thinks the dog understands the desired behavior but in reality, the dog is still learning or when the person is not giving a clear cue. I commonly see people get frustrated when they are teaching their dog to “stay”. This often happens when they expect too much from their dog too fast. For example, they may be confident that their dog can “stay” for 20 seconds in their living room. Then they take their dog to a busy park and they get frustrated that their dog cannot stay for 2 seconds. Although the dog is often blamed, this is a human mistake, the park is too distracting for the dog to behave the same away he behaved in the living room. Dogs (and people) make mistakes when they are confused. If the cue or request is not clear, dogs will often try to make a guess about what behavior is desired. This will occur if the cue is not consistent. For example, if you use the word “down” to have your dog lay on their stomach but you also say “down” to get off the furniture, it is likely that your dog will get confused about what behavior you desire. I recommend that people use a different word for different behaviors, like “down” for lay on their stomach and “off” for getting off of the couch. Sometimes dogs make mistakes because they are worried about a consequence. If your dog hates getting bathed and you say “come” when you are ready to give the bath, there is a good chance your dog will not want to come to you. If enough undesirable consequences happen after you say “come”, your dog may stop responding to “come” altogether. Dogs are motivated (or unmotivated) by the consequences of their behavior. If you notice that your dog is losing motivation with a particular behavior, you maybe providing an unwanted consequence by mistake. Mistakes are going to happen. Instead of dreading them or being embarrassed by them, learn from them. You and your dog will both be grateful you did!